Things to do in New York City? Jellies, my girlfriend and I are heading to NYC for my birthday (May 14th weekend). I have been there a few times, but, this will be her first time. New York City jellies, do you know if there’s anything going on in the big city at that time that’ll be a must see/do. We’re going for 4 days, so, I’ll get a chance to show her the touristy stuff. We’re skipping Broadway shows, will be checking out the MOMA, and doing the double decker bus thingy that’ll take us throughout the city. With that, we’ll be able to hop on and off at various stops, and it’ll give us a chance to have a look at various parts of the city. What about restaurants? What’s a must-do? Delancy Street, Second Avenue Deli, Alphabet City, Ellis Island, Roosevelt Island Tramway, 125th Street between Broadway and Park, Striver’s Row, West Village, Gracie Mansion, UN, Carl Schurtz Park, Columbia University, Museum of Natural History. Plan to spend an afternoon wallking through Central Park. It will be glorious in May and you’ll find it some of the best people watching in the city. Don’t be afraid of using the subways to get around and don’t be afraid of asking people for directions. If you go to the MET, don’t try to do it all. One of my favorite restaurants for a special night out is Union Square Cafe downtown. Both the food and the service are great. Bombay Sapphire on Columbus has great Indian food. Make sure to go to a good deli (another vote for 2nd Avenue Deli) and have bagels for breakfast one morning. Thanks so much, jellies. Very, very helpful! Definitely go to Carmines. It’s super easy to get to from Times Square and the food is delicious. They serve authentic Italian food in huge portions! It’s great. Another place that I love eating is Jekyll and Hydes. It’s seriously a good time. The employees are hilarious and definitely make it worth while. 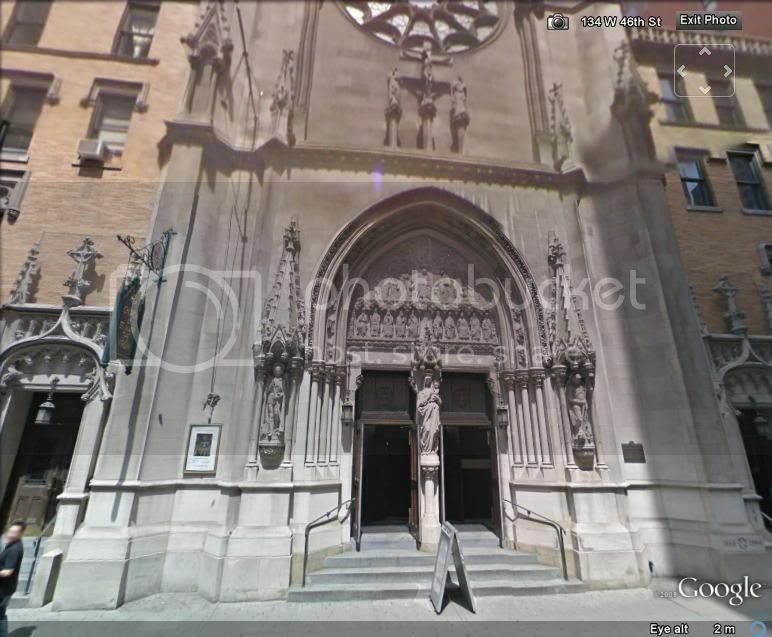 Obviously go see St. Patricks Cathedral, just because it’s absolutely breath-taking. Stop into Little Italy and go to the Doughnut Plant. Then of course there is the Empire State building, the Statue of Liberty, Central Park, Rockerfeller Center/Plaza, Wall Street, Macy’s, FAO Schwartz, Times Square, 5th Ave, Ellis Island, (seconding @dpworkin >) West Village. I’m pretty sure that’s all I’ve got for now! I have to demur about Carmine’s. The same guys own Ollie’s, Virgil’s BBQ and a few other restaurants. The formula is tons of food, indifferently prepared, at higher than modest prices. Far better to go to Patsy’s or some other really good Italian restaurant downtown. You might want to look for a book of walking tours of various neighborhoods that will point out the architectural and historical features, i.e., a literary walking tour of the West Village will add so much to your appreciation and enjoyment of it. There are also many companies that lead guided walking (and sometimes noshing) tours of the Village, Chinatown, etc. They are usually advertised in the Sunday NY Times. Big Onion is one organization that leads such tours. 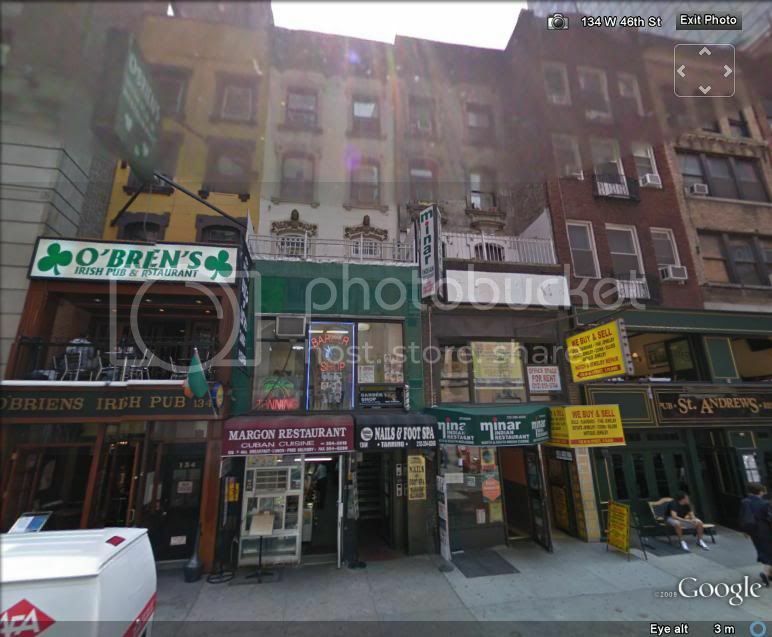 There are numerous cheap Indian restaurants in the East Village on 5th and 6th St. between 1st and 2nd Avenue. Having a drink (pricey) in the lobby of the Algonquin Hotel is another neat way to get a flavor of old New York. Oh! I’d also check out The Royalton Hotel. It’s an awesome place to stop in and get drinks at night. The lights are heavily dimmed, the fireplace is going, and there’s great seating. Pretty romantic. Try to avoid taking a cab. The subway and walking is such a better experience. There is always something to see and explore at every turn. Just wing it. But… The Musem of Natural History and the Guggenheim Museum are always my first place to go. And central park is right in the middle. Also, go to a pub and have a pint and get a good slice of pizza. If you haven’t seen Wicked, it’s amazing. But I’m just a tourist, not a native. For museums, you definitely won’t want to forget the Met. There’re a couple of smaller, eclectic ones around, but the must-sees are just the Met, MoMA and Guggenheim. both can be found at JeanGeorges. You also have to go toy Katz’s Deli . It is the Mecca of Deli’s. Once again, a demurral. Katz’s is an experience but the ambiance is shabby, the meats are cheap and fatty, the service is non-existent, and there are much better choices. Get lost. I would recommend starting in Central Park. There’s always a beautiful sight, a nice thing to see, and a great view of the skyline on the reservoir. Go whichever way you want. If something is interesting, take a look. Most importantly, just have fun. There are so many things in New York City that I still haven’t seen, and I’ve been living here all my life. You can be a tourist, some of that stuff is great. But still, don’t forget that the city has cultural nooks and crannies everywhere that are waiting to be found. Wow, that is a bummer to hear. I have never had a bad experience with Katz’s. Its ambiance is “New Yorkerish” and I even have them ship to me in Florida. But, to each his own. :-) And, their sandwiches are monstrous. Oh, and eat one of New York’s quality bagels! It saddened me a few weeks ago when somebody here on Fluther asked where to get a quality bagel and coffee in New York City, and one persistent jelly was suggesting Dunkin’ Donuts and iHop. @Pseudonym Oh I know..that’s the thing, there is so much to see and do!! We’ll have to go back again (and again). @jjmah Any time. New York City is an area of expertise. I have no idea, but your Q just reminded me of an Andy Garcia movie that I liked a long time ago: Things To Do in Denver When You’re Dead. As a resident of this fine neighborhood, I must insist that you hit up both the Brooklyn Promenade and The Brooklyn Ice Cream Factory on Fulton Landing. Both are near the Brooklyn Bridge. If you have time, I think that Governor’s Island might also be open by then, which lovely for a stroll and has a nice ferry ride involved as well. I’ve probably said it in another NYC thread, but…definitely go to Flushing, Queens for some amazing peking duck sandwiches and dumplings. We’ll have you two hang with the kids and later on we’ll take you to our favorite veggie restaurant, Red Bamboo. And we’ll tell you other places to go. @jjmah – Now THAT is the best way to discover NYC. @ChazMaz I hafta agree with you there. @breedmitch Are kidding me???? That would be great!! Thank-you so much! My girlfriend is a big Tim Burton fan. That is a shame. I’ll keep in touch with you for sure! @candide – I agree with everything you said except going to Staten Island. Saturday, 80th and Amsterdam Jakes Dilemma. Every saturday they have power hour from 8–9pm $1 beers, $2 shots. If your looking for something cheap to do in a very chill bar on a weekend i recommend that. @JesusWasAJewbot – I like that idea. Chillin in the Big Apple. The New York Pass is a ‘smart card’ – like a credit card with a computer chip inside – which allows you completely cash free entry to over 55 New York tourist attractions. It’s a bit like an ‘all you can eat’ buffet – once you’ve bought your New York Pass you don’t have to pay to get into any of the attractions covered by the pass and the more sights you see, the more money you save. Simply show the attendant at a New York Pass attraction your card, they will swipe it through a special machine and you will be allowed entry. A 3 Day Adult Pass= $125. What do you all think? Is it worth it? @jjmah You have to think about what you guys want to be doing when you’re here. If you are going to be mainly walking and looking or sitting in cafes and bars, it may not be worth it. Many of the museums in NYC, like MOMA, are now asking $15—$20 admission so if you do plan to go to 4 or 5 of them, it could be worth it. Oh – I just saw that you have a link to the list of attractions; let me take a look at it and I’ll add a further reaction. Oh, hey. This too, eh? And this. And this. Oh – I see it covers walking tours, zoos, the Empire State Building, the Circle Line and botanical gardens as well as museums. I definitely think it is worth getting. If anything, it will encourage you to do more things to get the value of it. @janbb We decided to go ahead with the pass. That way, we’re going to be covering a l lot of cool and interesting stuff. Like the surprise party lady from SNL, “I’m so freakin’ excited!”. Good. As I said, it seems like that will give you a lot of options of things to do and make it easier to choose to do more things. I would definitely encourage you to do a food and walking tour, particularly if there’s one of the Lower East Side and the Village. Keep talking to us as the planning goes on. The 92nd Street Y (link) has some cool-looking food and walking tours. For instance, there’s “A Taste of Old New York: Tour and Lunch” on 4/30/10, “Brooklyn Bus Tours: A Slice of Brooklyn Pizza Tour” on 3/27/10, and others. Funny. I’ll be passing that block in a few hours. Going to see a show. You’ll definitely be in walking distance to Rockefeller Center and a good stretch of the fancy 5th ave shops. Head down to 42nd and 6th and see the public library. Get lunch and sit in the sun behind it in Bryant Park. See what’s playing at the Ziegfeld or Paris theaters. Catch the train downtown and see the tall ships at the South Street Seaport. While there pick up cheap tickets for a broadway show. If you had two days and three nights to fill in New York City, what would you do? What's a good place to send my parents who are in NYC area for their 40th anniversary? I'm a looking for a cheap flight from Detroit to NYC and I want to book online, which site should I use?